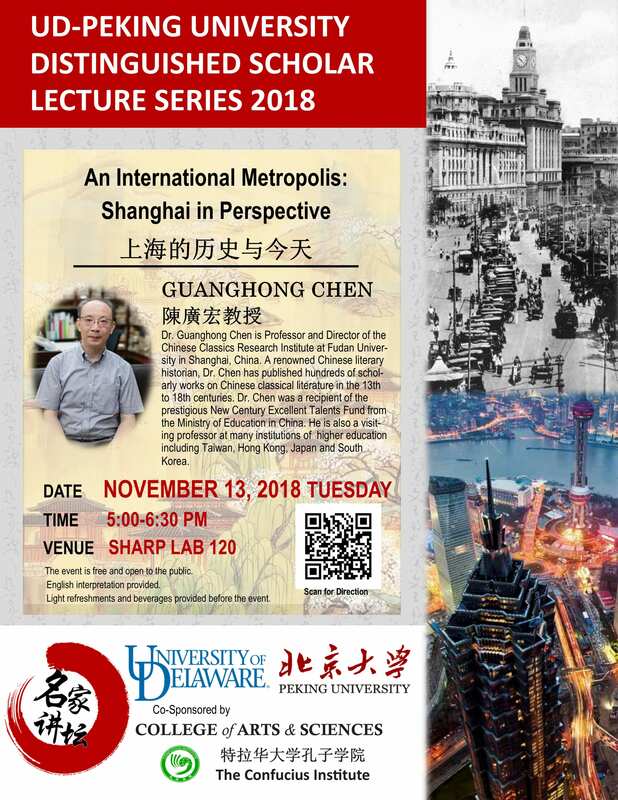 The Confucius Institute cordially invites campus and community audience to the annual UD-Peking University Distinguished Scholar Lecture Series on Tuesday November 13, 2018.. 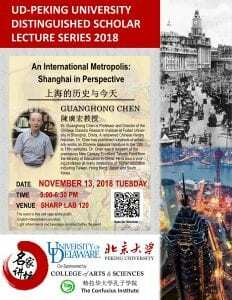 Professor Guanghong Chen (陈广宏教授) will give a talk on the An International Metropolis: Shanghai in Perspective (上海的历史与今天). Dr. Guanghong Chen is Professor and Director of the Chinese Classics Research Institute at Fudan University in Shanghai, China. A renowned Chinese literary historian, Dr. Chen has published hundreds of scholarly works on Chinese classical literature in the 13th to 18th centuries. Dr. Chen was a recipient of the prestigious New Century Excellent Talents Fund from the Ministry of Education in China. He is also a visiting professor at many institutions of higher education including Taiwan, Hong Kong, Japan and South Korea. English interpretation will be provided for this talk. Light refreshments and beverages will be provided before the event. The event is open to the public for free. This event is co-sponsored by the Dean’s Office of the College of Arts and Sciences and the Confucius Institute.